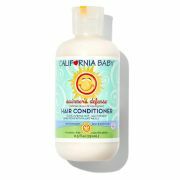 Our non-chemical, plant based, no tears formula is an all-natural botanical blend of herbs, rich emollients, and natural sunscreens that combine to leave delicate hair shiny and smooth. Light and fresh aromatherapy essential oils add a pleasant, calming effect. 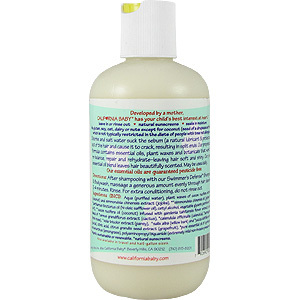 Works to protect from damage caused by chlorine, salt water, and the sun's harmful rays. 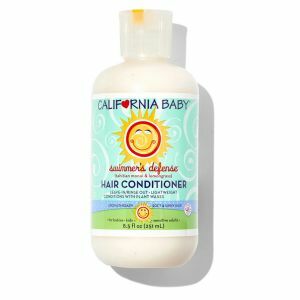 Other ingredients: No parabens, sodium benzoate, benzoic acid, benzyl alcohol, or phenoxyethanol. Swimmer's Defense Hair Conditioner is shipped in a discrete, unmarked package. Orders are processed immediately and usually take about 3 to 5 working days to be received. We do ask that you try it for 2 to 3 weeks to feel the full effects. Any information received is used only for order processing and shipping purposes. Your information, such as e-mail address, will never be disclosed to a third party.